Hello! 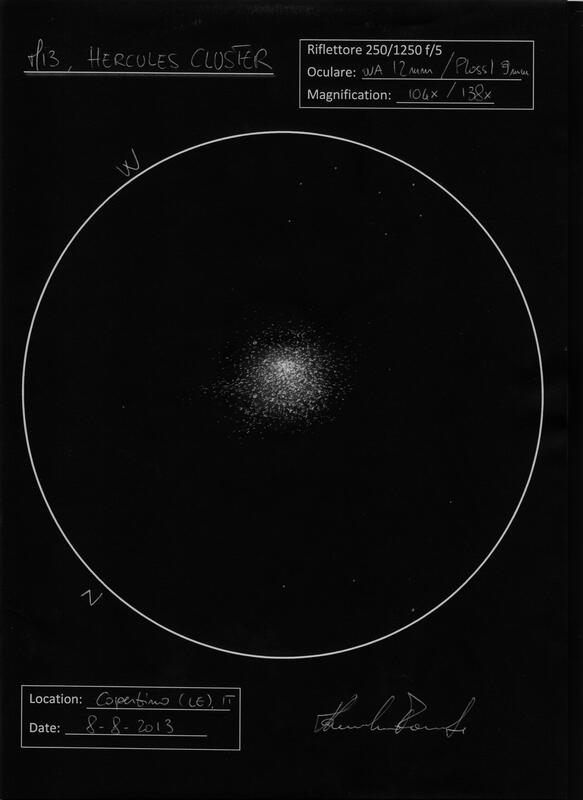 Last night I observed the most beautiful globular cluster of our sky. M13, also known as “Hercules Cluster”, has a a diameter of about 110 ly and is about 23500 ly away”!!! It’ s fantastic to see, is my favourite DSO. I obseverd it with my dobsonian telescope 10” f/5, with two different eyepiece: WA 12mm (104x) and SuperPlossl 9mm (138x), it’ s always wonderful! Bravissimo!! ancora un altro italiano che disegna!!Bene!! Very fine capture of the great globular cluster.